Great job, Vets! I hope someone is keeping close watch, or the thugs will be right over to destroy it. Combat vets, even wrinkled ones can be very dangerous. Hooray for these patriots taking a stand against the cowardly PC establishment. A group of war veterans in Massachusetts hung an “All Lives Matter” banner over their town’s American Legion Post because they are tired of the protests over a”Black Lives Matter” banner the mayor refuses to take down. “We seen what went on with City Hall. We’re not happy about it. We’re not knocking Black Lives Matter. We’re not knocking anybody … We don’t care about your color. 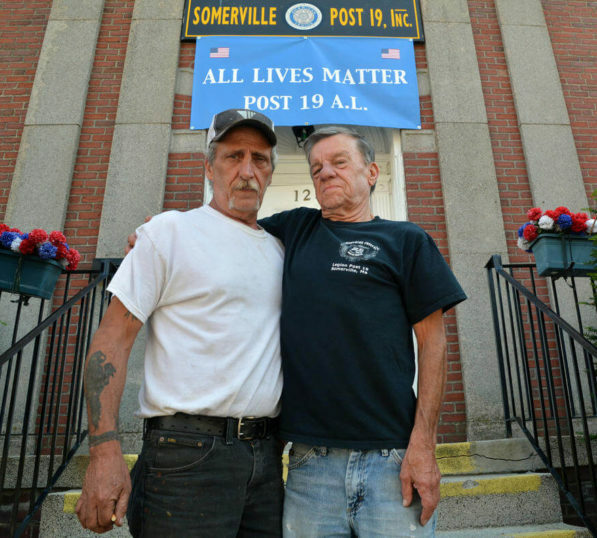 We don’t care about where you come from — all lives matter,” post Commander Dave Chamberlain told the Boston Herald.